Adam Aston is a Brooklyn-based journalist, editor and presenter who focuses on green business, energy, environment and cities. 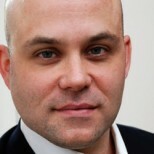 Previously, Aston was energy and environment editor at BusinessWeek. A senior writer at Greenbiz.com, his work also appears in the New York Times, NRDC's OnEarth and Technology Review. Can smarter storage solve our energy woes? Are Chickpeas PepsiCo’s Ticket to Sustainability?